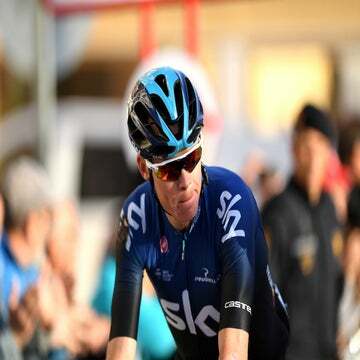 MILAN (VN) — Chris Froome’s results in the one-day races have never been the most impressive part of his palmares, and little changed with the Sky rider’s participation in the 2015 edition of La Flèche Wallonne today. The British 2013 Tour de France winner crashed in the hilly race in Belgium and rode up the Mur de Huy, hosting a 2015 Tour stage finish this July, 12:19 behind the winning group. Froome hit the deck in a right-hand turn with 12 kilometers remaining in the race with a dozen cyclists, including three from Swiss team IAM Cycling. He sat on the road for a few seconds, got to his feet slowly, and assessed the damage, which included cuts and scrapes down his left side. He eventually remounted and rode slowly towards Huy, to take on the 1.3-kilometer Mur. Rips in his black Sky shorts showed blood and road rash. Froome, however, rode on towards the line and finished 123rd out of 200 starters. Only 133 riders finished the race, which had more than its share of crashes. “Chris was also pretty banged up but showed real courage to finish the race and we’ll assess his injuries overnight. He hasn’t needed to go to hospital and right now as things stand, we’re still expecting him to line up at the Tour de Romandie next Tuesday,” Sky sports director Gabriel Rasch said. Froome’s resume in the one-day races would seem to suggest that they do not suit the skinny climber and winner of the 2013 Tour de France as much as the stage races do. His one-day record includes only a single victory, in the 1.2-ranked Giro del Capo in 2009. La Flèche Wallonne was his first one-day event of 2015. In 2014, he pulled the plug on Liège-Bastogne-Liège at the last moment and did not participate in a one-day race until his last event of the season, the World Championship in Ponferrada, Spain. “I still lack big results in one-day races, it is just not my forte,” Froome said in a phone conference last September. In 2012, he was even less optimistic. Team Sky could be concerned as the 2015 Tour de France approaches. This year, organizer ASO is using many of the same roads it uses in its classics. It will close stage three with the Mur de Huy climb and cover the cobbles of Paris-Roubaix in stage four. If Froome had trouble today, he could have trouble again in July. In 2014, Froome crashed on the stage to Lille and twice again the next day, abandoning the race 85 kilometers into the fifth stage, just before reaching the Arenberg cobbles. Though Sky’s Froome fell in today’s Flèche Wallonne, the team’s other general classification star Richie Porte enjoyed a victory just hours beforehand in Italy, winning a mountain stage in the Giro del Trentino and taking the overall race lead. The Australian is also due to race the Tour de France in July.